Aside from the kitchen, a master bathroom remodel is the most popular interest among our clients. The estimated cost for a full master bathroom remodel without changing the original footprint typically comes in around $35,000.00 to $45,000.00 for a large bathroom, and $25,000.00 to $35,000.00 for a small one. 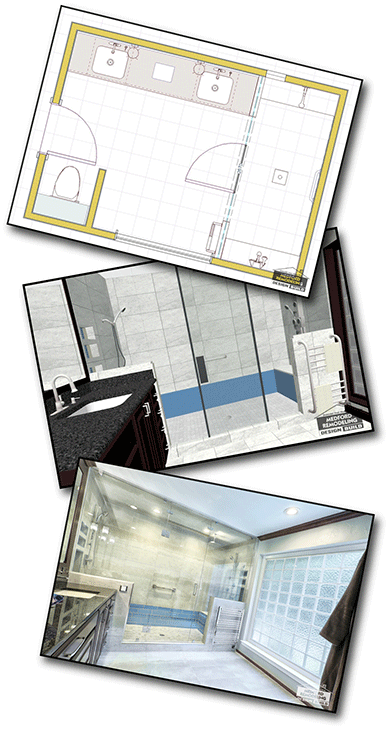 A large master bathroom is roughly 200 SQFT in size and includes a separate shower and tub, a toilet and two vanities. A small master bathroom is roughly 100 SQFT in size with a tub-shower combination, a toilet, and one vanity. The cost of a custom design package for your master bathroom is $750.00. The design package is initiated by signing a Design Agreement at your initial consultation.